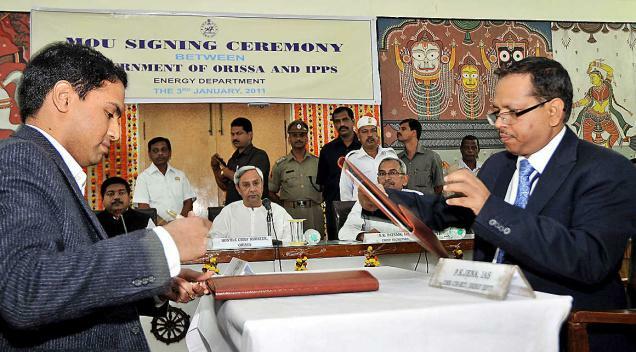 The setting up of a thermal power plant at Pitamahul in Subarnapur district and an asbestos plant in Bargarh district has raised concerns about displacement, livelihood loss and environmental degradation among the residents of the two districts. 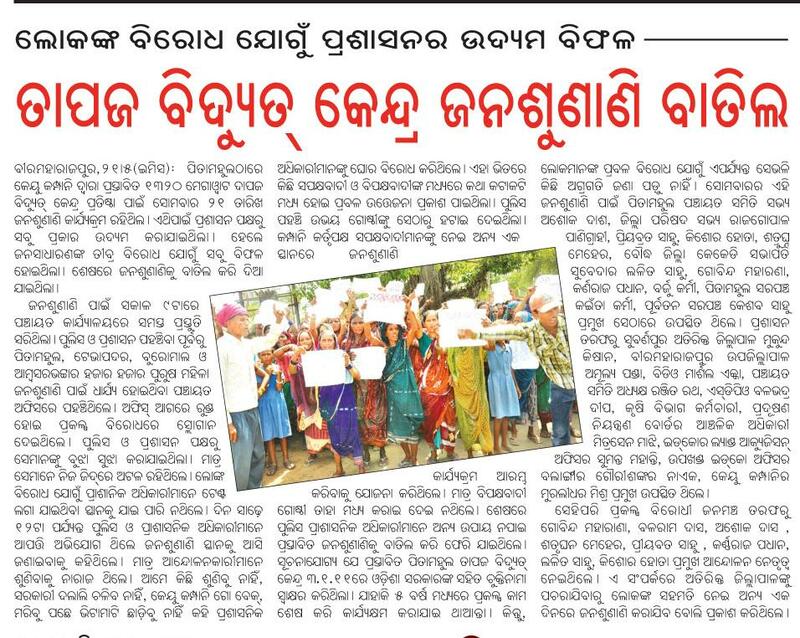 It may be recalled here that the residents had also opposed tooth and nail the Sahara power plant at Luturbandh in Titilagarh of Balangir district following which the fate of the project still remains uncertain. KU group of companies is going to set up a 1,320-MW power plant at Pitamahul and Tevapadar villages near Subalaya in Birmahajpur sub division of Sonepur district with an investment of Rs 7, 500 crore. A total of 900 acres of land is required out of which 800 acres would be acquired from private people and the rest 100 acres would be acquired from the Government, said Project Manager the company Bidhu Ranjan Mishra. Once the plants comes up, it would further improve the economic condition of people of the area by providing them jobs, besides helping in growth of ancillaries industries in that area. It would also go a long way in improving the entire scenario of the area of Sonepur district, claimed Sonepur District Collector Gagan Behari Swain. However, a meeting was held at Buromaal recently which was addressed by Prafulla Samantary of Lok Shakti Abhiyaan and Priyabrata Sahu, among others, who opposed the setting up of the project. 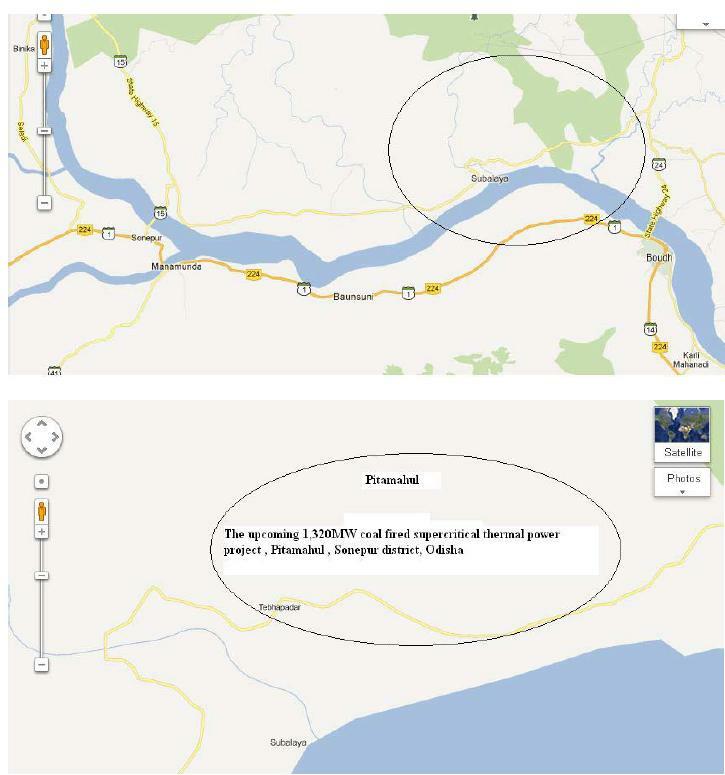 The thermal power plant would cause severe fly ash pollution. When the mercury laden ash falls in the ground and comes in contact with water and aquatic animals, it would increase mercury pollution resulting in serious health hazard, said Priyabrata Sahu. Moreover, the temperature in the area would go up and it would also reduce ground water affecting the livelihood of hundreds of poor farmers of the area, Sahu cautioned. 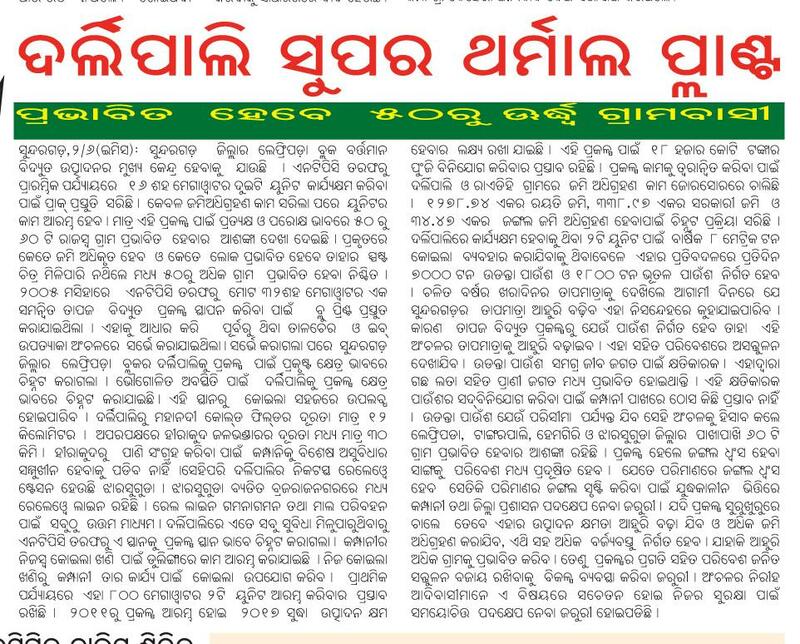 The condition of Jharsuguda and Angul belt should be an eye opener for those proposing to set up the thermal power plant here. The requirement of power as projected by the Government is not intended for the common masses, but for the power hungry big industries. 1 kg of aluminum production requires about 15 units of electricity, which requires vast amount of coal to be burnt and water to be vaporized. Besides, it causes green house emission with sulfur, nitrogen, carbon contents. The vast amount of fly ash would contain considerable amount of heavy metals and radioactive materials, said Amitabh Patra of Baragarh. The scenic beauty of Pitamahul and Tevapadar area is really enchanting. The bird population of the locality is impressive. But the project would affect the precious flora and fauna, besides resulting in severe water pollution, said activist Amitabh Patra. Setting up thermal power plant at Pitamahul is not appropriate as this area frequently faces problems of drought and water scarcity. The Mahanadi river is already water stressed, which cannot bear the water requirement of the power plant. 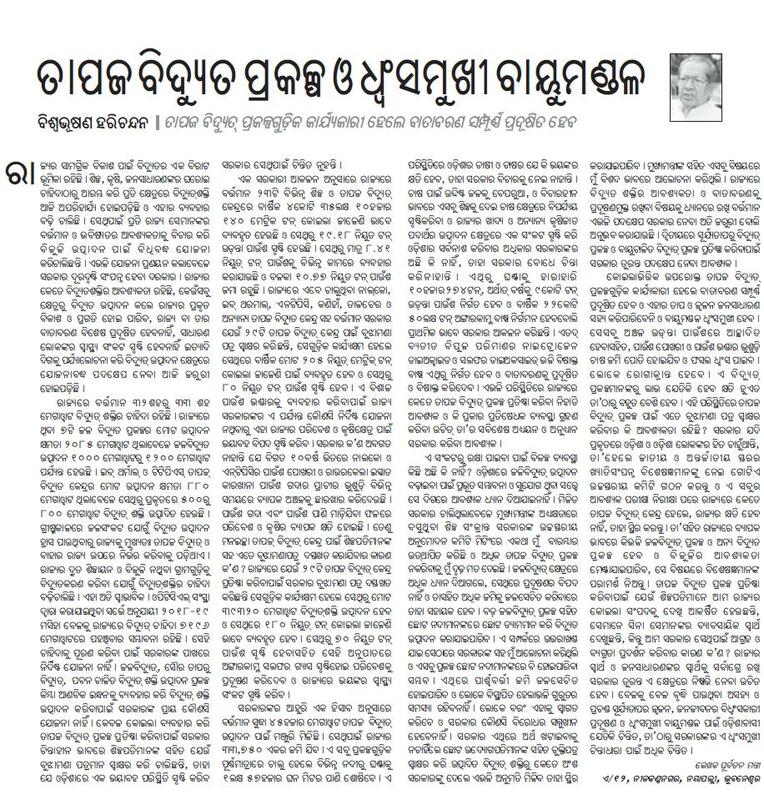 Setting up a thermal power plant is like hammering the fate of the farmers and ecology, said Ranjan Panda, Convenor, Water Initiatives Odisha. 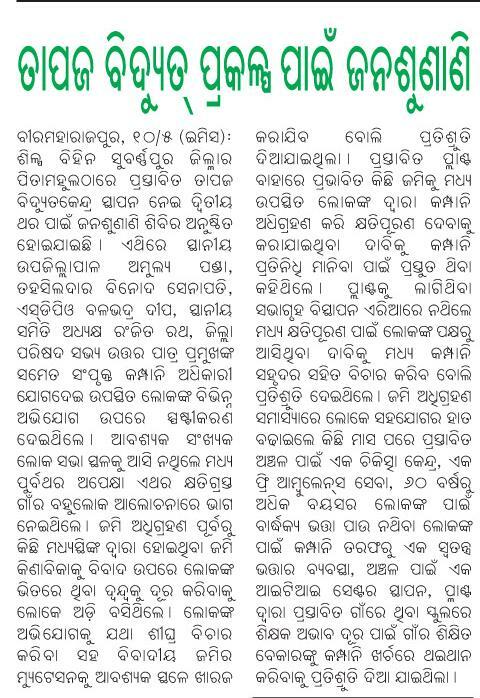 Meanwhile, opposition to Vishwakarma Roofings, an asbestos cement plant in Baragarh has already gained momentum. 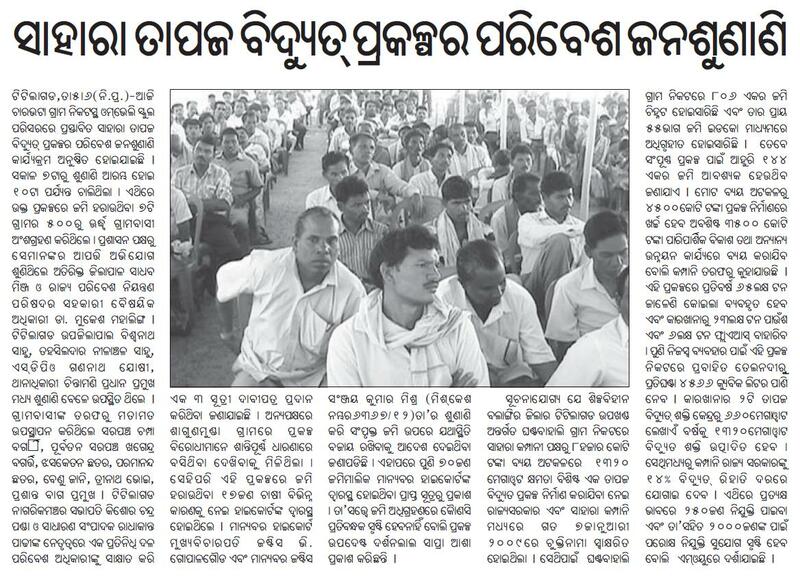 People from 10 villages held a meeting on May 22 and pledged to oppose the plant, which has purchased about 20 acres of land in the middle of Naagaom, Lebidi and Kendpali villages of Sohela block. Among others, farmer leaders Saroj Mahanty and Lingraj of Jan Chetna Parishad addressed the gathering. They said the factory would cause severe dust emission by which as many as 42 villages in 10 km radius of the factory would be affected. As the company requires huge amount of water, it would deplete the groundwater affecting the livelihoods of hundreds of farmers, besides drying up ponds, wells and other water bodies, they pointed out. KU Projects Pvt Ltd, a fully owned subsidiary of Ind Barath Power Infra Pvt Ltd (IBPIL) intends to set up a 1320 (2×660) super critical thermal power plant at Pitamahul in Sonepur district at a total investment of Rs 7260 crore. The MoU was signed by K Raghu, chairman of IBPIL. KU Projects Private Limited (KPPL), a subsidiary of Hyderabad based Ind-Bharath Power Infra Pvt Ltd (IBPIL), will set up 1,320 MW (2X660MW) coal fired supercritical thermal power project at Pitamahul in Sonepur district with an investment of Rs 7,260 crore. The company requires 820 acres of land and the water requirement of the plant will be met from the Mahanadi river system, company sources said. If everything goes as per the plan, the company is confident of commissioning the first unit in 30 months. The construction work is likely to be taken up in the first quarter of the current year.